Officer of the Day Joe Dash Jr. The installation of Officers will take place at the Post Home on Mier Drive on Saturday, May 19th at 3:00 PM. A meal will be catered for guests and members. 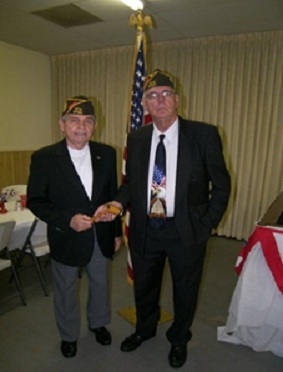 Homer Williams VFW has their meetings the 1st Thursday of each month. Anyone interested in joining should contact Mike Peats – Commander at 985-502-8802 or David Rice – Quartermaster at 504-236-5451. Mike Peats accepting the gavel from past Commander Robert Massa.